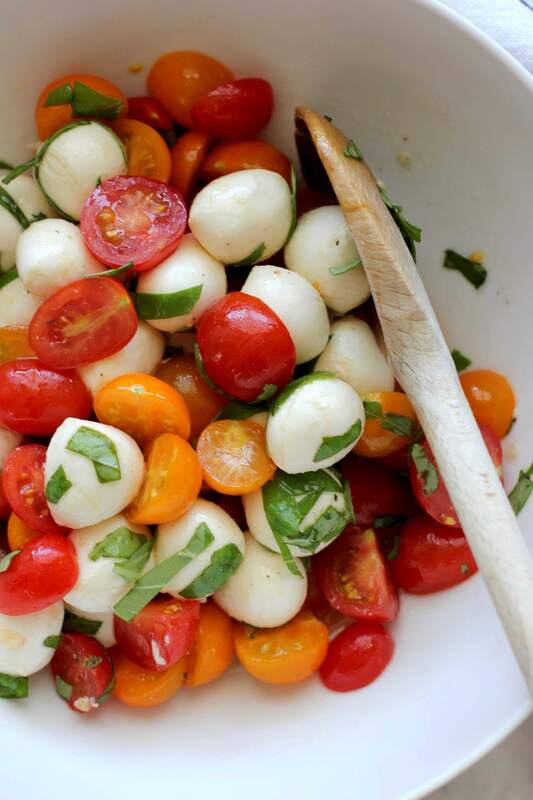 Fresh mozzarella and tomato salad – a simple salad of creamy mozzarella and cherry tomatoes. An easy side dish to make that’s a summer favorite. 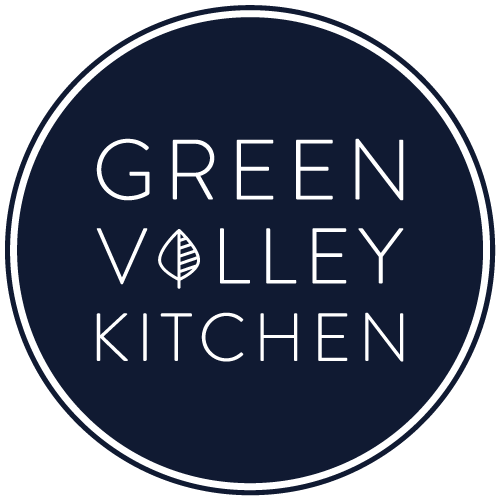 Recipe updated 7/07/18: New photos added, recipe adjusted and nutritional info added. Sometimes simple is better. This fresh mozzarella and tomato salad is a perfect example. Take two ingredients, toss them in a simple but flavorful dressing, add lots of fresh basil and you’ve got something absolutely delicious. 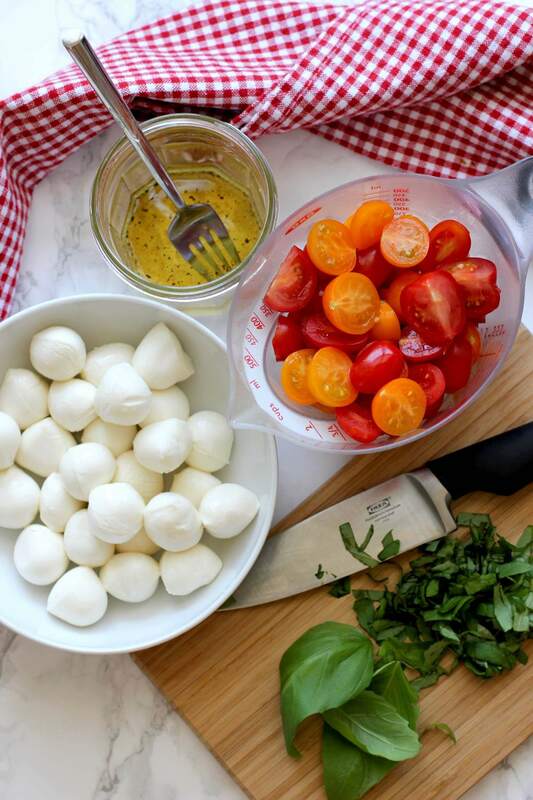 Fresh, creamy mozzarella and crisp, juicy cherry tomatoes are a perfect summer combination. Add a white balsamic vinegar dressing and toss with lots of fresh basil and you have a great, simple salad that is ready to eat in no time at all. Prep all your ingredients – slice up the cherry tomatoes, slice up the fresh basil and whisk together all the dressing ingredients. 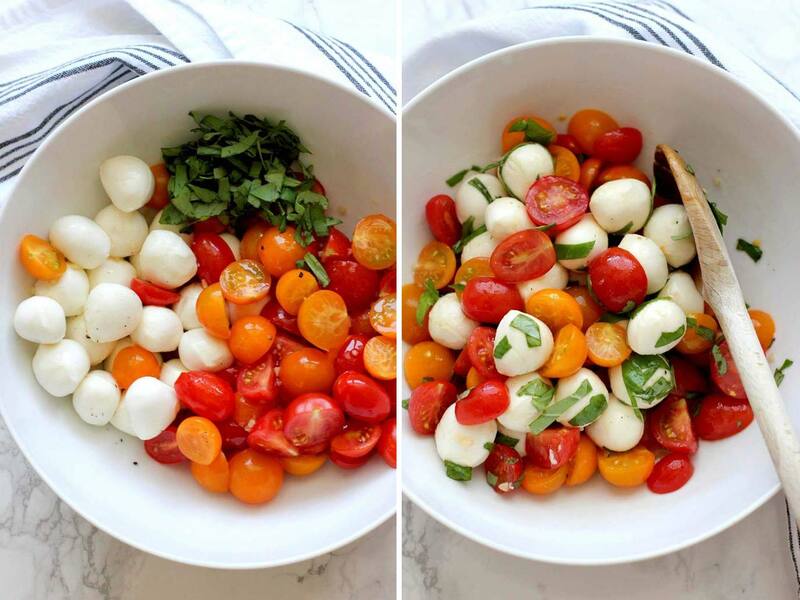 Add fresh mozzarella, cherry tomatoes, basil and dressing to a large bowl. Gently toss all the ingredients together and you’re ready to serve. I used white balsamic vinegar. If you use regular balsamic vinegar it will tint the salad (the fresh mozzarella in particular) a reddish/brown color since regular balsamic vinegar is a much darker color than white balsamic vinegar. Fresh mozzarella should be used in this dish. Fresh mozzarella is soft and creamy. Do not use regular mozzarella – it’s too hard. Summer tomatoes are a key ingredient in this dish. If you’re not growing them this season then check your local farmer’s market or vegetable stand for ripe, juicy cherry tomatoes. If you make this recipe and enjoy it, please leave a comment and a rating. I’d love to hear from you! A simple salad of creamy fresh mozzarella and sweet cherry tomatoes. Any easy side dish to make that’s a summer favorite. Slice cherry tomatoes in half – I used a combination of yellow and red tomatoes. Add to a bowl. A mozzarella balls to the tomatoes. It’s important to use fresh mozzarella in this salad. Whisk together olive oil, white balsamic vinegar, minced garlic, honey, black pepper and salt. Pour over mozzarella and cherry tomatoes. Add basil to salad and toss gently until combined. I used white balsamic vinegar in the recipe. If you use regular balsamic vinegar it will tint the salad (the mozzarella in particular) a reddish/brown color since regular balsamic vinegar is a much darker color than white balsamic vinegar. If you make this recipe and enjoy it, please leave a comment and a rating on my website! Hi Michelle – sorry for the late reply – this should be fine in the fridge overnight. I don’t think it will hold up well for any longer than a day in the fridge though – tomatoes don’t really like to be refrigerated. I love this salad and the dressing have made it several times ! Hi Maureen – thanks so much for letting me know! Aren’t home grown tomatoes the best. Thanks so much for leaving a rating as well – much appreciated! Hope you have a great long weekend.